The Warne Ballroom Restoration Project has been recognized with a 2017 District of Columbia Award for Excellence in Historic Preservation in the Stewardship category. Since 2003, the District’s Historic Preservation Office has sponsored an annual awards program to honor outstanding preservation projects and exceptional contributions by individuals and organizations in support of historic preservation in the District. The presentations were made on May 23, 2017 at DAR Constitution Hall. A panel of District historic preservation officials and outside experts selects award recipients from submitted nominations. For the Warne project, the co-nominees were the Cosmos Club Historic Preservation Foundation, which provided the leadership and the bulk of the finances; the Cosmos Club, owner of the mansion; Whiting-Turner Contracting Company, general contractor; John Milner Associates Preservation, architects for the restoration; and John Canning & Company, the principal contractor for architectural finishes (painting, gilding, plaster, woodwork and floor restoration). The nomination submission, available here, opens with historical notes about Mrs. Townsend’s showpiece and architects Carrère and Hastings and designer Jules Allard & Fils, who created it for her. It also describes the extensive research done by CCHPF and the experts they engaged both before the project was authorized by the Club’s Board of Management and throughout the restoration process. 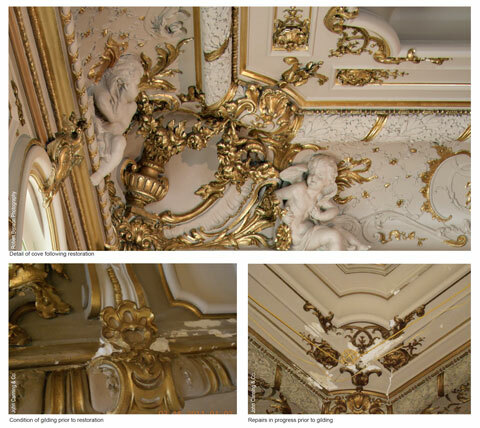 Although the restoration of the architectural finishes and paintings was completed in early 2012, the award nomination was held until the draperies were installed in 2016 so that the unusual history of their reproduction could be included. At the awards ceremony, Andrea F. Schoenfeld accepted the award on behalf of the Foundation, and J. Stephen Huebner(’73), who oversaw the ballroom restoration on behalf of the Club, accepted the Cosmos Club’s award certificate. Read full story in the Bulletin. The decade-long restoration of the Cosmos Club ballroom, guided and largely funded by the Cosmos Club Historic Preservation Foundation, combined extensive research, pursuit of historical accuracy, and expert craftsmanship to bring one of Washington’s finest Gilded Age ballrooms back to its original appearance. Carrère and Hastings designed the residence at 2121 Massachusetts Avenue, (1899-1900), the Cosmos Club since 1952. The interiors, including both architectural ornamentation and furnishings, were the work of the Parisian firm Jules Allard and Sons, a preeminent designer of French style interiors for the wealthiest stratum of European and American society at the turn of the twentieth century. The Cosmos Club ballroom had never been altered but wear and tear, roof leaks and overpainting had taken their toll. 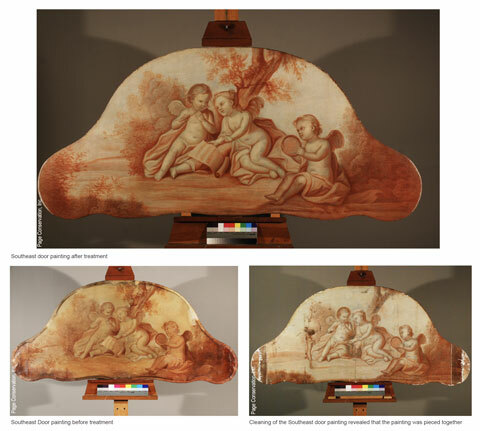 Historic photographs were scanned at high resolution and enhanced to extract every possible detail, contemporary accounts were searched, extensive paint and metallic sampling was done, and the original drapery fabric was located and reproduced. 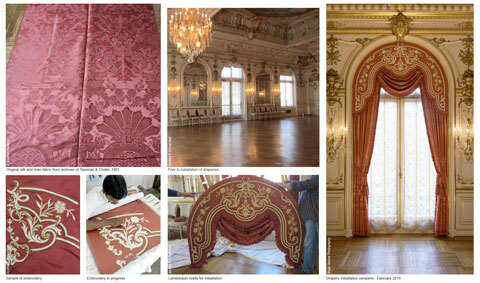 Recreation of the original drapery fabric and installation, seldom possible in restoration projects, proved dramatic in bringing out the ballroom’s color scheme and architectural symmetry. The project, completed in 2016, restored the original splendor of a Massachusetts Avenue mansion at the start of the American Century.